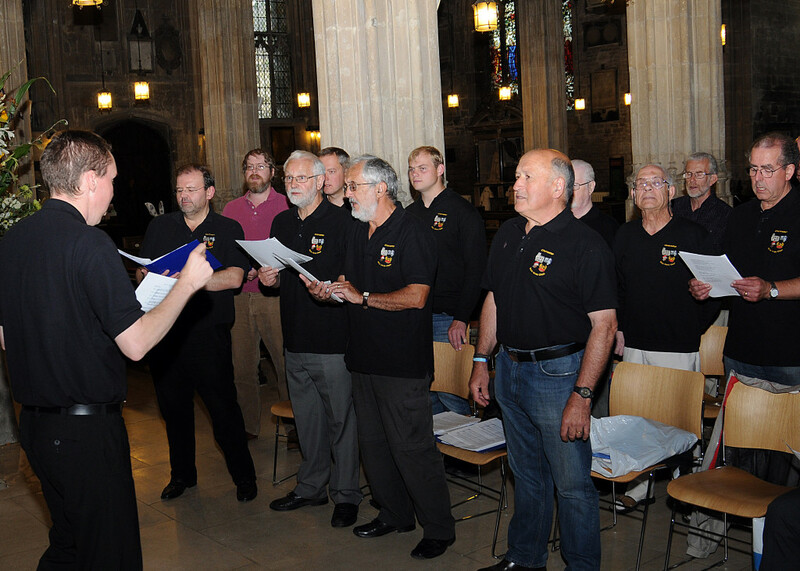 Concerts by visiting male voice choirs have always been a sell-out in Cirencester. But until a few years ago the town never had a choir of its own. 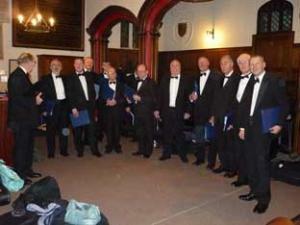 Phil Kerton set about correcting this anomaly, and on the 12th December 2009 – a mere three months after he began recruiting – twelve men (shown right) made their first formal appearance as Cirencester Male Voice Choir. Since that initial performance, the choir has gone from strength to strength, growing in numbers, with a membership ranging in age from 16 to 85 and over. The choir performs an annual concert as a focal point, whilst also performing for many charitable organisations throughout the year, helping to raise a substantial amount of money in the process. Back in 2012, the choir performed alongside The London Welsh Male Voice Choir at the Royal Albert Hall in a concert of the highest quality. Quite an achievement for a choir so much still in its infancy, and a concert where they more than held their own amongst a number of well established, highly regarded choirs. 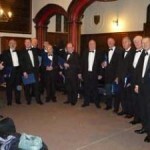 They went on to a national competition in Torquay in March 2012 where they won the accolade of ‘Happiest Choir’ – an indication of the fun and enjoyment its members gain from being part of the choir. The choir is honoured to have as its patron the Right Honourable Earl Bathurst, and appreciate the support and sponsorship of local firm Alexcar Coaches. We meet once a week on Mondays at the Parish Church in Cirencester Market Place. Meetings have a relaxed and lively feel, starting at 7:30, finishing by 9:30 and occasionally followed by a drink down the pub. The social element to meetings is important – encouraging friendship and generating a strong, cohesive musical unit. To join us, send us a message, or speak to any member for further information. Alternatively, just turn up at one of our practices. You’ll be made to feel welcome and we’ll be sure to find a spot for you in whichever section you feel comfortable in, whether that be with the tenors, baritones or the bass section.